Despite temporary rules enacted by the city council to preserve low-income SRO housing, property owners are converting buildings into boutique hotels. A developer group that includes A's minority owner Lew Wolff bought the Sutter in June. In December 2016, the Oakland City Council imposed emergency regulations to preserve the city's residential hotels, which provide affordable housing for thousands of low-income people — including many who are at risk of becoming homeless. A month later, the council extended these protections to December 2018, enacting a moratorium on the conversion of single-room-occupancy (SRO) housing into other uses. But the rules don't appear to be working as intended. In at least one case, a developer is moving ahead with plans to turn a building that used to house dozens of low-income residents into a boutique hotel just two blocks away from City Hall. Furthermore, the city doesn't appear to have any mechanism to track what's going on at the 17 SRO hotels clustered around downtown, Chinatown, and West Oakland, or to ensure that building owners are complying with the emergency moratorium on converting residential hotels to other uses. City officials also apparently haven't made any progress in drafting permanent rules to protect and preserve SRO housing, as cities like San Francisco have done. The situation doesn't come as a surprise to former SRO residents who have lost their homes over the past several years. "It was only a gesture," said Orlando Chavez about the city's moratorium on the conversion of residential hotels. The moratorium is supposed to bar hotel owners from taking any action that "converts one or more existing residential hotel units to be used for other residential or commercial activities." "The problem," said Chavez, who now lives in Berkeley, "is that there's no enforcement; there's no sheriff when it comes to Oakland." Chavez used to live in the Hotel Travelers, but he lost his home after it was purchased by developer Danny Haber. In 2016, Haber began to redevelop the SRO hotel, a process that resulted in the displacement of all the former low-income residents. The situation at the Hotel Travelers prompted the city council to impose the moratorium as an emergency stopgap. But at the Sutter Hotel, a 102-room building at 584 14th St. that, for decades, operated as a residential SRO, the moratorium doesn't appear to be stopping a conversion. In 2016, the building's then-owner, Raj Singh quietly started to empty the building through evictions and buyouts of long-term residents and put it up for sale, according to former residents and court documents filed by Singh and his tenants. Then in June 2017, six months after the city extended its SRO conversion moratorium, the Sutter was purchased by an investor group that includes Oakland A's minority owner Lew Wolff and Ross Walker of Hawkins Way Capital, an investment company that buys distressed residential hotels and converts them into boutique tourist properties, public records show. It's unclear whether Singh was still evicting and buying out tenants at his building after the council enacted the moratorium. It's also unclear whether there were any SRO tenants still living at the Sutter when Wolff, Walker, and their partners bought it. The moratorium ordinance states that hotel owners can't convert units that are "intended or designed to be used" as SROs, but it also exempts buildings in which "every unit is rented exclusively on a less-than-weekly basis." Singh didn't return a request for comment for this story. Since taking it over this summer, Sutter's new management has posted a new rule in the hotel's lobby barring guests from staying more than five nights. The new policy effectively means that the building is no longer being used as an SRO. On Sept. 18, the new owners submitted an application to Oakland's Planning and Building Department requesting permission to demolish numerous walls and fixtures and to remodel the entire hotel by adding bathrooms to every room and to expand the restaurant space on the ground floor. Their plan also calls for adding seven new hotel rooms to the rooftop penthouse and possibly adding a rooftop bar and terrace. Asked about his plans and whether the hotel will permanently cease operating as an affordable housing resource, Walker wrote in an email to the Express that he would be "happy to share" plans, but declined to provide specifics. He also didn't answer questions about the city's conversion moratorium and whether it might interfere with his proposal. He also wrote that he will be unavailable for further comment until January. 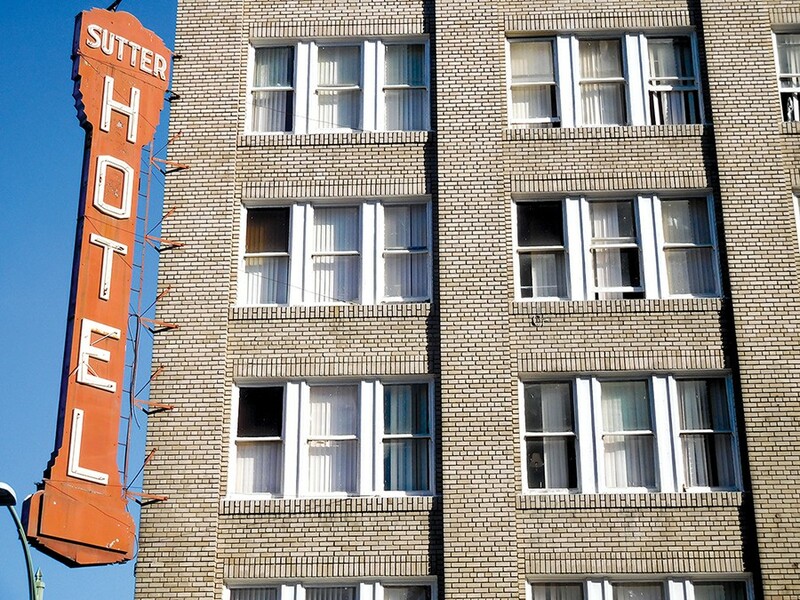 City officials have yet to determine whether Walker's plan for the Sutter Hotel violates the SRO conversion moratorium. Deputy Director of Planning and Building Darin Ranelletti wrote in an email to the Express that "the department is still reviewing the submittal and whether or not the moratorium applies." The city's Housing and Community Development Department also plays a key role in overseeing the preservation of low-income housing and making sure the residential hotel conversion moratorium is enforced, but department director Michelle Byrd did not respond to multiple emails and phone calls seeking information about how she is tracking what's going on at the city's residential hotels and how her agency is enforcing the moratorium. The only effort the city council has undertaken to protect its residential hotels since passing the moratorium in January was to support state legislation sponsored by Assemblymember Rob Bonta, D-Alameda. His bill would have permitted Oakland to block landlords from invoking the state's Ellis Act to remove SRO units from the housing market and convert them to condos, offices, or other non-rental housing. Bonta's bill was defeated in a vote on the assembly floor, however. According to Randy Shaw, executive director of the Tenderloin Housing Clinic in San Francisco, there's a lot that Oakland can do to preserve SROs that doesn't require state legislation. "It's really simple to save SROs," said Shaw. "They could pass the same kind of ordinance Los Angeles passed — or San Francisco," he said. San Francisco passed its residential hotel ordinance in 1981 and has updated it several times over the years. In short, it prohibits owners of residential hotels from doing anything to convert a residential unit into a tourist hotel room or any other kind of housing unit or non-residential property, except in a very limited set of circumstances. And it prevents the demolition of this type of housing stock in order to prevent homelessness. San Francisco's law imposes criminal penalties and fines for landlords who violate the law. In 1985, Oakland had 2,005 residential hotel rooms, but as of 2015, when the last official count was made, there were only 1,403. Last year, city staffers estimated that approximately 712 SRO units, or half of those remaining, are at risk of being converted to market-rate apartments, boutique hotels, or other uses. Weathering the Heat The Wrong Path?